One of my favourite traditions when it comes to Birthdays and Christmas is gathering up all my presents into a pile somewhere and admiring them all for a week or two before I find new homes for them and they become part of my day to day possessions. Perhaps Librarians really are dragons and this hording of mine has something to do with me building up a pile of treasure? Does anyone else do this with their gifts? This year I have amassed quite a large pile of books and they are all so lovely, new and exciting. This was one of the domestic fiction books recommended by Jane Brocket in her fantastic "The gentle art of domesticity" - I've been borrowing what I can from the Library, but as I had no luck getting hold of this one I decided to treat myself. With a little boy in tow our family weekends seem to have become a bit restricted so I've been looking for some inspiration to try and break out of our routine and make the most of our weekends together. Who could resist a cook book about childhood treats inspired by children's fiction? Not me that's for sure! 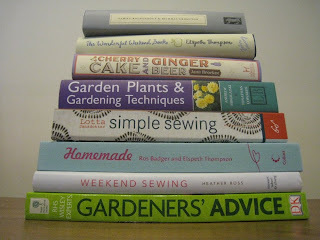 With all the extra time I've been spending at home I've been getting into the garden more and to help me improve my gardening know how (which is pretty basic at best) I also received a couple of surprise gardening books this year. I've heard very good things about this book - it seems that all of the craft blog reviews have only good things to say so I'm really looking forward to having a read through and trying a few projects. This is such a beautiful book - so good in fact that it while having a quick look through I got hooked and read it from cover to cover. My review of it is below. This is another well known sewing book that has received great reviews - the pattern you may be seeing here is simple and quick so hopefully these projects will give me the confidence to dust of the sewing machine and have a try. This looks to be a beautifully presented book on gardening which has all kinds of useful information, especially for garden novices like me. From my huge stack of Birthday books I've so far only managed to read through one, but it was certainly one that was worth taking my time over. "Homemade" is written in seasonal sections giving you plenty of ideas and inspirations for some beautiful and simple things that you can make or do. Most of the projects have brief instructions, but some are just ideas accompanied by beautiful photographs to give you the freedom to create something unique. The projects range through a wide crafty spectrum including baking and gardening to sewing, knitting, crochet and card making as well many other types of projects that are so simple there isn't really a term for them. There is a real emphasis on re-use in this book which I just love. Most of the suggestions for keeping back items that most would just throw away I was pleased to find I already did. 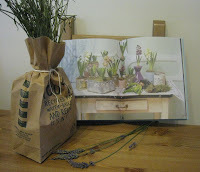 Hopefully my large stash of 'too nice to throw away' items will start being found uses for, I've already thought up a few things to do with the lavender shown in the photo that I have been carefully snipping from our garden.